A couple of days ago I wrote that I wanted to go to Le Parker Meridien. Well? Of course I went there! So – Le Parker Meridien (119 west, 56th street) is a fancy hotel on one of the streets close to Central Park. The lobby is enormous and you could almost get lost in the place. No one would ever think there’s a burger joint hiding somewhere in there (even to it’s not that “secret” and you can smell the grill all the way out) I didn’t have time to think too much about the actual entrance though cause I was concentrating on finding where we were heading. I had invited two friends so I was the one in charge and had to lead the way. Red, thick, curtains and a small hidden neon light in the shape of a burger was all I needed and a new world opened to us! 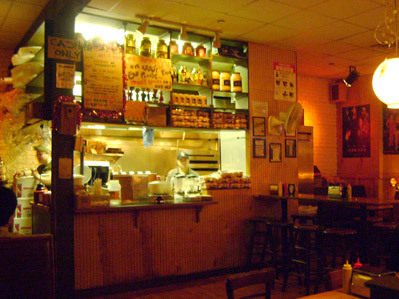 The burger joint was busy and far away from fancy. Daub all over the walls, boots and bar tables and a long line to the counter. It wasn’t like Shake Shacks 45 minutes line, more like 10, but still very crowded. While you were waiting the signs told you to be prepared – you will get 3 questions and if you don’t answer them quick enough you have to do the line again. – How would you like it cooked? 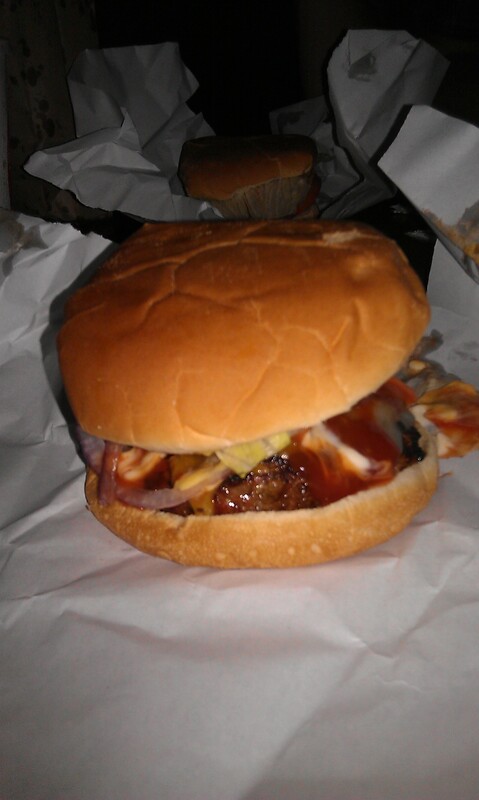 Medium rare cheese with The Works was my order and the old school, wrapped-in-paper burger turned out great! Juicy with a rich taste. Took the pickle away cause it gave too much flavour and if you’re sensitive to mustard I would order it without cause I was quite strong. My friends had fries that tasted like McDonalds, e.i. pretty good, and a vanilla shake that evidently got a good score! Sorry – you just have to get used to my crappy pictures as long as Im chosing to dine in these dark, hidded spots! Is it really close to Hyde Park or are you just London-home-sick?